This past weekend, I felt compelled to view in-person some of the newer works that Philadelphia-based oil painters are conjuring up inside their studios as of late. New Faces of 2012 currently at Artists’ House Gallery, in downtown Olde City, showcases eleven regional artists who seem to approach the oil painting medium as a self-unique foray into the practice of depicting their subjects. Whether it be figurative subjects, landscapes, still-life paintings, or in the case of artist Laura Adams – one sees a realist painter’s deep-delving into the power of decorative patterns as three-dimensional illusion. 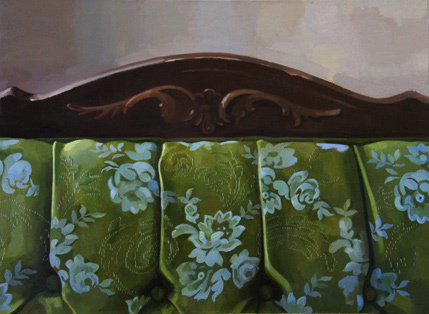 Liam’s Couch (oil on linen, 14″ x 19″) shows Adams’ fascination with pattern and in this case, uses the floral motifs that are reminiscent of textile designs from nineteenth-century artist/craftsperson, William Morris, of the famed Arts and Crafts movement of painters and designers. One cannot “get” the sense of intimacy that these paintings exude just by looking at reproductions – the scale and size of most of Adam’s oil works are generally in this exhibit no larger than a maximum of 16″ on one side – as witnessed in other pieces such as Cockatoo & Pomegranates (oil, 5 1/2″ x 4″). Naturally, being a metalsmith and designer myself, I am fascinated with how Adams is able to integrate a pair of organically-styled metal earrings into her composition with such grace and deception. 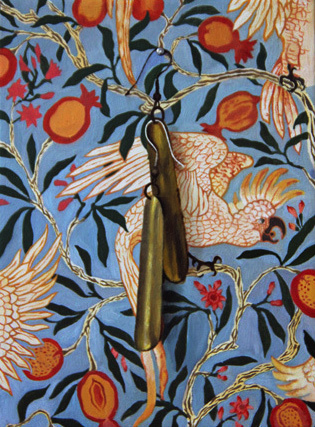 Those cylindrical metal earrings appear to dangle from a vine that moves fluidly around the entire perimeter of the painting. However, there is no such actual metal object – it is realist painterly illusion, similar to trompe-l’œil. So much decoration and beauty found in yet so intimate a canvas is what makes these oil pieces contemplative and unified as a body of work. Painter Monique Lazard uses the oil painting medium in a interpretive, visceral way to depict her figurative subjects and the emotions or complacence they may be feeling. 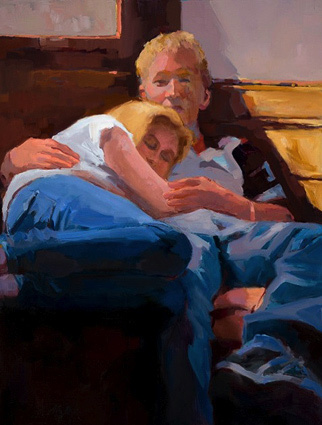 College Visit (oil, 40″ x 30″) shows what appears to be a college-age male/female couple entwined in an embrace. The female subject’s facial expression is one of sincerest comfort, while the male subject is sitting nonchalantly gazing into space. Is he comforted by her visit? Or, one can go in many tangents with a very different narrative. Lazard aptly uses brushstrokes on the male subject’s face, on both of their denims and their hair to feed the “air of mystery” with tactfully-placed highlights vs. a lower-left darkened contrast. Additional oil paintings by Lazard seen in this exhibit, such as Homage to Gauguin and Laundry Day depict frontally-positioned female subjects – with Lazard’s brushstrokes being the most paramount item of the artist’s painterly interpretations. The play of light and varying opacities of color create the primary focal point for the viewer; it is what leads one to want to interpret each of her painting’s meanings or associations. Laura Adams and Monique Lazard are two of eleven artists exhibiting this month, at Artists’ House, May 30th through June 24th, located at 57 N. 2nd Street in downtown Philadelphia, PA. Other artists featured in this group show are Julie Bell, Stacy Castor, Mark Fiorenza, Jeremy Graeff, Ryan Jackson, Robert Lipartito, Ronda Lynn Michel, Wilson Ong and Jeffrey Thomsen. Thanks so much for the nice comments; I’m enjoying reading your blogs as well! Just getting to know you! (thanks for your recent visit and connection). These reviews are interesting – it is great to hear first hand what is going on in the rest of the world, from a person rather than an official channel! Thank you, Seascapesaus. I’m enjoying following your blog very much – and looking forward to seeing more from you! Thank you for stopping by!